Our carts customizable for each pet and are developed by a veterinary orthopedic surgeon. 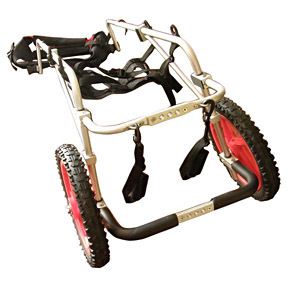 Our carts for dogs are made with a lightweight non-rust aluminum frame, all-terrain tires, and adjustable clip on Harness. Our Carts for dogs are designed based on the canine skeleton; they are supposed to align with your pet’s bones. Dog wheelchairs have hip joints too; they attach the leg of the cart to the main frame. If your cart is adjusted properly, your dog’s hip joint should be aligned to your cart’s joints. Downward pressure towards the front of the cart is normal. This pressure should be on top of the front legs. Adjust the straps until the loop is snug against the shoulder. Depending on the health of your dog’s back legs, they should only touch the ground lightly or barely at all. If your dog’s back legs can still bear weight, allow them to touch the ground and you do not need the rear leg straps that can be attached to the frame. However, if your dog’s back legs are non-weight bearing, adjust the leg straps to lift the legs off the ground while keeping them at a relaxed angle. The horizontal bar should be parallel to the ground and aligned with your dog’s spine. See if the horizontal bar of your dog’s cart is aligned like this. If not, adjust the harness or the cart itself to reach that level. With a cart, your dog’s back should be straight or at least slightly arched up. Ensure this by affixing and adjusting the front harness. Carts for dogs that are well-adjusted to allow your pet to assume a natural position despite injury or paralysis. The main frame, horizontal bar, front harness, and rear harness support your dog’s torso and imitate the function of the spine. Similarly, hip joints and support loops act as legs that support the wheels of the carts. Best Friend Mobility can provide you with carts that are fully customizable and easily adjusted.